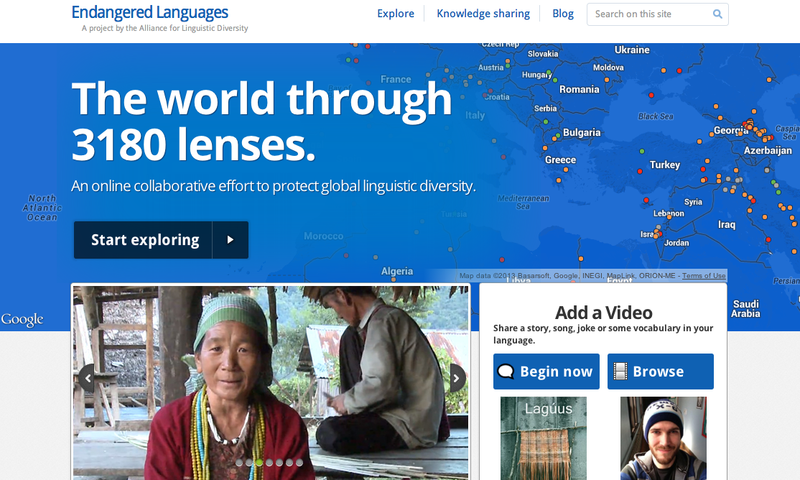 Above, the current front page of the Endangered Languages project, an online collaborative endeavor to promote global linguistic diversity (see the EL blog and EL Facebook page). Endangered Languages is also one of the featured elements of the Smithsonian Folklife Festival now underway in Washington DC (see the "One World, Many Voices" homepage). Snapshot taken 3 July 2013. What I find so interesting here (in the outreach and public relations materials for these projects) is the affective mechanism of salvific representation at play. National Geographic publishes gorgeously aestheticized images of colorful, weird underwater creatures (see HERE and HERE) or super-cute endangered marine animals (see HERE) -- and sends the implicit message that we should somehow act to preserve them. In a similar fashion, the magazine offers a set of carefully crafted and curated images of human environments through the work of photographer Lynn Johnson; her "Vanishing Voices" gallery suggests that languages themselves must be rendered exotic, appealing, "worthy" of being saved. Johnson has the very curious task of working to "translating" lived, dynamic human language into static images for (progressive and openminded) mass consumption and edification. And she manages to achieve these effects quite well through these highly evocative scenes -- with images interwoven with informative text. The "story" these images tell about indegneity and located-ness of languages is crucial as well. This photo gallery gets us "interested" in languages that we might not otherwise know or care about, but also images remind us that it's not enough just to describe, capture, or "record" any given language. Nor can we simply take a language--a living thing--and simply "transplant" it from one geocultural or social context into new place and expect it to thrive there. Preserving a language is as much about preserving a (distant) way of living and thinking as it is about a way of speaking. For a language to flourish, one must also sustain its entire sociocultural habitat. In my own teaching, try to instill oral performance of Middle English in the original language -- or rather, its editorial (re)construction as printed in the Riverside Chaucer (or whatever edition we might be using at the time). Voicing Middle English aloud is just one way of physically inhabiting a language that is not one's own. So how does one fully reinhabit an already-dead language, or quasi-moribund-zombie language (such as Anglo-Saxon, Old Norse, Anglo-Norman, Middle English)? To what extent are we -- by which I mean literature scholars, linguists, historians, and others -- acting as stewards of tongues, or sustainers of "lost" historically distant ways of living? We are in the business of reanimating zombie languages on an everyday basis, when you think about it. Take Latin, for instance. The Vatican (in the discourse of a New York Times article written last in fall 2012) continues to "breathe new life" into the language order for it to survive in a modern secular world (see HERE), and to some extent Latin has its own "cultural life" in the modern world through other avenues: new coinages are generated in Latin via institutionalized religious contexts (e.g. see words for "computer," "jet(plane)," and others in the Lexicon Recentis Latinitatis), but new coinages are also created via secular means, as previously unattested species are identified and given official Latin names (see the fly named for cartoonist Gary Larson). In these little ways Latin does continue to have a "life" in our contemporary world, but thinking about how a language like Middle English or Anglo-Saxon might "live" today is perhaps a different prospect. We will never know what the language of Chaucer or the Beowulf-poet or Kempe actually sounded or "felt" like, and whatever we offer will always be a strange living-and-dead fantasy: a (lovingly researched) reconstruction. Perhaps best way, then, of thinking of our activities as scholars, historians, teachers, students (people interested in the linguistic ecologies of the past) is to say we are not detached (social) "scientists" nor paternalistic/parental curators and custodians but rather inter-temporal ambassadors, people who mediate between present-day audiences and distant, seemingly alien cultural environment. Yet even this ambassadorial comparison is inexact: most envoys or emissaries have (or should have) a secure sense of the interests that they are "supposed to represent" or advance. In our own ambassadorial functions -- our living in and with past and present languages -- we are in a position that is much more flexible and cannot be disentangled from professional and personal desires. Through our work with texts (or music, drama, manuscripts, sculpture, architecture, what have you) we not only grant partial access to an alien past or distant cultural habitat; we also actively reacquaint ourselves with our own time and place, recognizing the strangeness of the manifold world that we inhabit now and think we know so well. * Something I admire about the discourses of linguistic preservation on such websites is how they avoid starkly utilitarian or capitalist justifications. I wouldn't want to make the argument that if we "lose" indigenous languages, we might lose an important cultural "resource" such as indigenous knowledge of the medicinal value of Amazonian plants, or what you will (what a shame if such cultural knowledge could no longer be exploited by pharmaceutical corporations!). This is a provocative meditation on a vexed project, Jonathan. As part of my own project I've been thinking a great deal about languages becoming alien to themselves -- meaning that in a 500-1000 year period, any given language changes so much that it no longer comprehensible across that temporal divide. Many medieval authors got around the problem of language change over time through a faith that ancient langaues were permanently frozen and was not going anywhere. Thus Mandeville writes of a two thousand year old grave (Hermogenes the Wise) found in Constantinople beneath Hagia Sophia bearing a gold plate on which is inscribed in Hebrew, Greek and Latin “Jesus Christ shall be born of the Virgin Mary and I believe in him.” Henry of Huntingdon keeps thinking ahead to the future he is hoping to communicate with in spans of 1000 years. Three millennia hence he thinks he will be forgotten but has faith people will still be reading and understanding his Latin address to them. But not all medieval authors were quite so sure about language stability, as you point out with Chaucer. Matthew Paris describes how a book was discovered at St Albans, composed in an unknown language and with enigmatic lettering. An ancient translator is finally located so that the contents of the codex might be known. The venerable artifact bestows its history of the monastery’s patron saint and then immediately disintegrates. That's language loss in action! I'm unsure whether this relates directly to your post, though I believe there are some affinities here. Jeffrey and Jonathan -- also Erkenwald! The written language carved on the tomb is incomprehensible; only speaking (granted miraculously through a Pentecost mass) bridges the divide. @Anonymous and @Jeffrey: Your two comments might seem unrelated, but what both your anecdotes reveal so nicely is the affective power generated by *narratives* of language death. The disintegrating codex described by Matthew Paris suggests that a language might to some extent "live on" after death so long as *its stories* (its life force?) is passed on into the future (even through another language). Arnie Thomasson (seems very interesting!) posits that literature -- with or without the presence of living users? -- can keep languages alive. So much of the discourse of language endangerment is predicated on the notion "language death" and I wonder if these narratives aren't offering counter-stories of "language life" -- and the idea that languages might find ways to live *without* the human speakers/users that "possess" them.